Is there a way to define functions in a stylesheet? So far I have managed to write my stylesheets without the need to use my own custom functions or definitions. For instance, maybe I have some color that I wish to use throughout my stylesheet. The reason I would like to do this is that later on, if I change the color, every style that depends myColor will automatically change. This can apply to other functions that you might create. I know that I can use any built-in function I want in the stylesheets. Is there a way to define custom functions to use in a stylesheet without making a package? If making a package is the only way, how can we make sure the stylesheets that use such package load the package first so that the styles are properly defined? 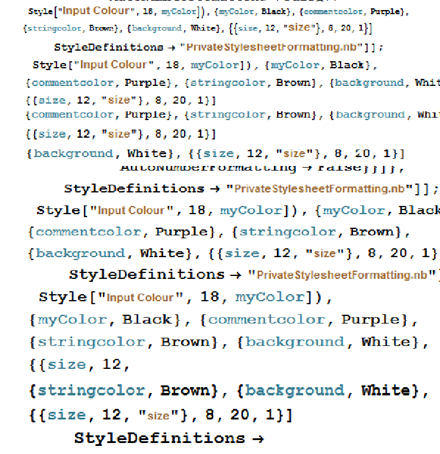 2) Open your custom stylesheet, say "myStyle.nb", then go to Format->Edit stylesheet to edit the stylesheet's style, and prepend a cell similar to the only one you have there, but inheriting from "myStyleParameters.nb"
The reason you cannot, for example, enter Red in a stylesheet is because it is typically written in the underlying box code. By analogy you cannot choose show expression and replace RGBColor[1.,0.,0.] in the underlying expression with Red. By combining code for "Input", comments, strings and so on you can dynamically compare combinations of font and background colours to create a stylesheet that you personally find aesthetically pleasing. "Do you also know if it is possible to copy all the definitions from a stylesheet to the private stylesheet?" means the stylsheet is taking its styles from the default stylesheet. So you don't have to copy over any styles. If your private stylesheet is based on one of the nested stylesheets you would insert e.g. You can now distribute "mystylesheet.nb"
There is no reason these expressions cannot be generated programmatically using the familiar tools of expression construction and manipulation. If you have a style sheet that needs frequent changes create a meta-stylesheet program that builds the desired style sheet with whatever parameters you give it. You may find that style1 and style2 is still without color. It's because color style is not defined for this stylesheet notebook but for "nb". You can see it has been correctly formated. And if you change the color in color style definition cell, color of style1 and style2 will both be changed. Not the answer you're looking for? Browse other questions tagged packages stylesheet or ask your own question. How to set dynamically stylesheet definitions? How do I create a package from an existing notebook? Is it possible to have versioned stylesheets?